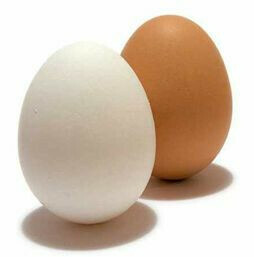 Faith Community Nurse Blog - Eggs... Did you know? Did you know?... Eggs are safe to eat 4 - 5 weeks after the "expiration date" or "sell by" date. There is also a three-digit number you can find under the expiration date that tells you the date the eggs were packed. Example: 041 tells us that the eggs were packed on day 41 of this year or February 10th. A number of 120 would indicate that the eggs were packed on April 30th. You can also test the freshness of your eggs by placing them in a bowl of water. An egg that floats to the bottom and lays on its side indicates that this egg is very fresh. An egg that floats to the bottom but stands up indicates the egg is still good to eat. An egg that floats to the top is no longer fresh. Also, eggs are a great source of protein. Eating an egg a few times per week has not been found to raise your risk for heart disease or stroke. An investigation done by an American Journal of Clinical Nutrition has found that a high egg diet had no detrimental impact on blood cholesterol numbers. However, if you are at risk for these diseases, it is best to eat eggs in moderation - just like everything else we eat!